The students of Edify School, Mandsaur celebrated Diwali with great enthusiasm. Entire Edify staff participated in the celebration. The celebration of Diwali, ‘The festival of lights’ came really alive at the school when the whole school wore a festive look, adorning the reception area and corridors in bright colours. The Rangoli done by students added the perfect setting to the festivity. 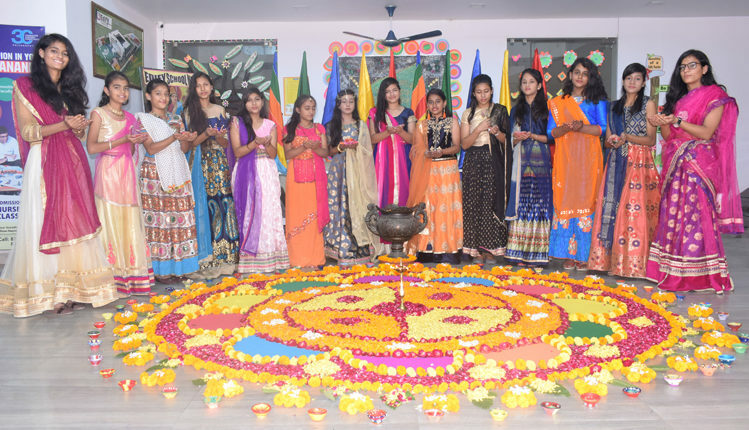 Students Put their heart and soul and made Flashy, vibrant and eye catching rangoli and decorated the earthen lamps (Diyas).At the end of the celebration students realised that the greatness of a culture can be found in its festivals. Surana Education Society is a registered educational society based out of Mandsaur, India. The society members are driven by the shared vision of providing the youth of India with quality education options that are accessible and socially inclusive contributing towards the global community. "Edify is like a second home for us and we have a special relationship with the school. My son has been with the school since Grade 1. I credit Kaushal’s education…for what he is today. I believe Kaushal has been doing very well on academics thanks to the school…!"